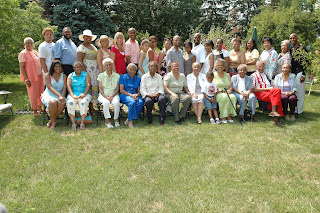 I grew up in a very close knit family—immediate and extended—siblings, cousins, aunts, uncles, grands. We were all within walking distance, or a, “don’t break a sweat” bike ride from each other, and doors were always open and welcoming. As kids, we cousins knew the intricacies and secret places in each other’s houses as well as we knew those in our own. And although we were aware of the technical degrees of separation—who was a first or second cousin (or how many times removed), great uncle, or in-law, none of that mattered. We were family. These days, we are scattered—some still in Buffalo, New York, others as far away as Amsterdam (not New York—the one of tulip and wooden shoe fame), but even though miles separate us, I’m happy I can say that all these years later, we still have the same ease and familiarity. We are still family. This getting older thing is quite a journey, and as I looked at my relatives and took note of the bridges that connect the generations—children and grandchildren of those of us who used to be the children—I could see the map of my life. It was all right there—where I’d been, and where I was going (If I’m lucky!). I mean, when I was a kid all of my adult relatives were OLD—at least as far as I was concerned. At 8 or 10 or 12, you dream of being 18 or 21—maybe even 25. Past that? Way too many years to comprehend. But time marches on. My cousins and I are now older than our folks were back when we were eating Thanksgiving dinner at the children’s tables (3 card tables awkwardly arranged in Nana’s living room), running through the backyard sprinkler on a hot August Saturday, or shivering through a Memorial Day picnic—Buffalo in May wasn’t adrift in snow (as is widely rumored), but the fact that it wasn’t exactly warm enough rarely stopped us from welcoming the summer with the inaugural cookout at Aunt Helen and Uncle Gene’s. Funny enough, we cousins don’t think we’re old now. Guess our folks didn’t think they were either. As a little girl, I can remember sitting in Aunt Ele and Uncle Cam’s living room with the drapes drawn, watching family movies from a previous gathering. Not dvds or videos,‘cause they didn’t exist. This was a clicking, whirring Super 8 projector that took forever to set up and get the film threaded on the sprocket the right way. But we all waited patiently because for us, this was entertainment! Anyway, during these bargain matinees I would glance over at Aunt Eleanor sitting in the window seat as she narrated, and marvel at the fact that she was a grown up, but her feet didn’t touch the floor. I have to tell you, I watched her last Saturday night, perched in a chair opening her gifts, and I found myself amazed that her feet—neatly shod in high-heeled, strappy sandals and crossed demurely at the ankles—still didn’t touch the floor. But that night I don’t think any of ours did. We were all floating on her cloud. I am one of the “scattered,” so I dosed up on family, and my fix will have to last me a few months, but like Donna’s mom’s accident, this occasion was yet another reminder to celebrate all of our todays. Find the good, look for the joy, sing your song just like Aunt Eleanor. I know I will. My cousin, Aunt Eleanor’s daughter, reads our blog regularly and told me she has been enjoying our Mother Mondays, so these next 10 signs you’re becoming your mother are for you Lib--you can only hope! By the way Aunt Ele says we can start now to plan her 100th. And there’s a new album with a few pictures from the party.